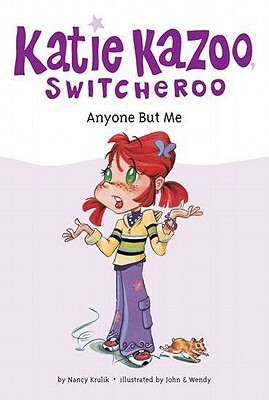 Katie Carew, nicknamed Katie Kazoo by the class bully, had no idea what would happen when she wished that she could be anyone but herself. But now her wish has come true, and-switcheroo!-she keeps turning into other people and even animals! What is one ordinary third-grade girl with a really extraordinary problem to do? It's a good thing Katie is resourceful and smart enough to find a solution for every problem . . . no matter how much of a disaster she causes! Katie can't stand George, the class bully. He constantly picks on everyone, but he really torments Katie. One day, she can't stand it anymore, and she wishes she could be anyone but herself. What she doesn't see is the shooting star that flashes through the sky at that moment . . . catapulting Katie into a crazy series of adventures, starting the next day when she turns into the class hamster! Will she be trapped in a glass cage forever? Will she ever be a girl again? Nancy Krulik is the author of many media-related books for young adults, including The New York Times best-seller Leonardo DiCaprio for Archway.